The Clicgear 3.5 has several improvements over the original design. An increased cargo net storage, a new easy-clip bag strap system, an improved umbrella storage clip and a redesigned brake system with a new cable anchor pivot assembly which eliminates cable wear and damage. The Clicgear 3.5 continues to improve the Clicgear cart range being designed to last and be repairable if needed. No rivets, wires or cheap parts to keep them together. Just properly engineered components and structures. Call us on (06) 364 6468 to get the best NZ price on the Clicgear 3.5. The Rovic® RV3F is a Full sized three wheel cart which is designed to be easy to use and still full of features. The RV3F can accommodate almost any bag size and keep it in place when the cart is folded. This makes the RV3F perfect for storage at the golf club. The RV3F shares the Clicgear Accessory Tab system allowing the use of the many Clicgear standard accessories with this cart. The RV3F uses an easy one step folding system. 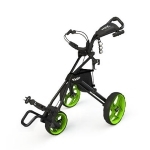 The front wheel is fully adjustable to allow for perfect tracking throughout the life of the cart. 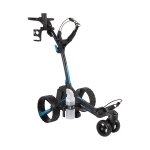 Large 13” rear wheels make this cart very easy to push as well. All RV3F carts come with a ball clip, cup holder, standard umbrella mount and storage net. Call us on (06) 364 6468 to get the best NZ price on the Clicgear Rovic. 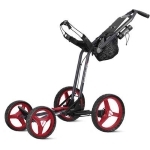 The newest version of our popular Micro-Cart®, the Micro-Cart GT has numerous improvements including a self-locking lower latch, a mesh basket, and a new upper latch that makes adjusting your handle height even easier. The updated upper bag bracket nests stand bags and secures your bag with bungee cords. 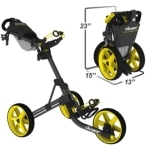 Call us on (06) 364 6468 to get the best NZ price on the Sun Mountain Micro Cart GT. Play shots under less fatigue with the new MGI Zip Navigator, as you walk free around the course while your buggy does all the work. Featuring MGI’s renowned full directional remote control, roam free and experience the ease in which this motorised buggy moves around the course. Control the speed remotely while the automatic downhill speed control feature effortlessly takes control down any hilly terrain. The most significant technological triumph on the Zip Navigator is what lies within. Traverse across the toughest of terrain and watch as the Patented Gyroscope automatically tracks the buggy on a straight course. Walk free and play hard with the Zip Navigator. Call us on (06) 364 6468 to get the best NZ price on the MGI Zip Navigator. Hi Christine, My new trundler is great. Thanks for the great advice, price and your service was great. Hi Alan and Christine, Just thought I’d let you know that I’m loving my new set of clubs. The Flightscope fitting session was great. Hi Christine, I love my new F.J waterporoofs. Just the right shade of pink! Thanks for the great price and service. Great store, many thanks for the professional and honest service to provide to Bridget, myself, and the kids when purchasing equipment, and also when asking advice about the game. Always our first person to call. Thank you for the lesson and the new clubs! I look forward to using these clubs in tournaments and such and hopefully play well with them! So thanks again! Hi Alan, I can’t believe how much better I’m hitting my new set of irons. I’d never have thought I’d have gained so much yardage. Copyright © 2019 NZ Golf Outlet. All rights reserved.